The Easter Egg...A Christian Symbol? US Flags and Flag Standards must be removed from all graves by July 15th each year. 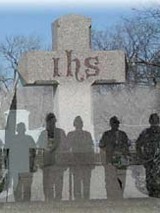 This is according to the policy of the Milwaukee Catholic Cemeteries described in our Visitation & Decorations brochure. We recommend that family or friends take the flag and standard home for return to the grave again next May 1. To read our complete policy on this matter, click here.